Dr Allan Minister for Learning, Science and Scotland’s Languages recently invited SSAC to consider Scotland’s scientific infrastructure and future needs and requirements. 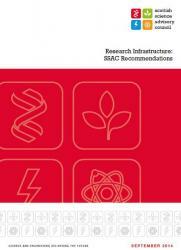 The work has now concluded with the publication of their report Research Infrastructure: SSAC Recommendations. This timely piece of work has been done in parallel to wider activity across the UK in this area. In November 2013, the House of Lords Science and Technology Committee published an inquiry report recognising that scientific infrastructure plays a vital role in underpinning the UK’s research excellence and its translations into wealth creating outcomes. The Department of Business Innovation and Skills (BIS) published their response to the inquiry in February 2014. The BIS response to the report was positive and made a number of commitments including to undertake an open consultation on Science and Research: proposals for long-term capital investment The consultation took place during Spring 2014 and the results will form the basis of a UK ‘Science Capital Roadmap’ setting out the UK Government’s long-term plan for a world-leading science and research infrastructure. SSAC provided a response to the BIS consultation. A copy of their response can be found here.